Large wind ripples with superimposed small ripples on the Namib Dune of the Bagnold Dune Field, Gale crater, Mars. Strange sand formations somewhere between ripples and dunes have been found on Mars, which scientists say will help them glean information about the evolution of the planet's atmosphere. On Earth, water and wind create large, sweeping dunes and small ripples a few centimetres wide. But this new type of Martian dune has wave formations on the scale of several metres. The observations, made by the Curiosity rover and the Mars Reconnaissance Orbiter, were reported in Science. Ripples and dunes are certainly not confined to Earth and Mars. Venus, Saturn's moon Titan and even the comet 67P/Churyumov-Gerasimenko have some kind of wavy pattern etched into their surface. 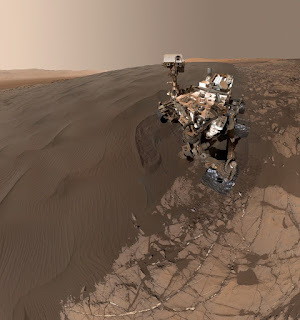 But when Mathieu Lapotre from Caltech in the US and colleagues analysed images of sand formations beamed back by Curiosity rover, which is trundling around Gale Crater, they knew they were different to anything on Earth. Their shape and spacing looked as though they were created by water currents. But Gale Crater is a desert. So what was going on? Lapotre's team drew on previous experiments that explored how ripples form on Earth and modelled how these new "wind-drag" ripples might have formed under the thin Martian atmosphere. They found the shape and size of the Martian ripples matched their modelling. They also calculated the effects of a thicker Martian atmosphere and found ripples would shrink. So by identifying ancient waves in sedimentary deposits and measuring their size and shape, the researchers suggest they could work backwards to calculate the thickness of the atmosphere at the time.